Do we want a world of more stuff and strife? Or can we create a better life? The concepts of more and better are the basis of social narratives about how things are and how they could be. These narratives—The Story of More and The Story of Better—offer a framework for educating about sustainability and social justice. Reframing the Curriculum is based on this concept. The book is the culmination of 20+ years of work in the areas of curriculum, teacher education, and policy. 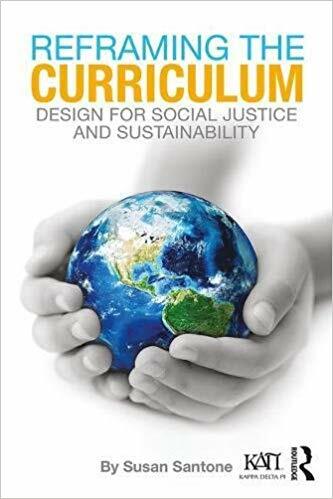 The book offers a practical, hands-on guide to weaving the concepts of healthy communities, democratic societies, and social justice into project-based instruction across grades and disciplines. Part I outline the philosophies, movements, and narratives shaping the future, with a focus on the world at large. Part II examines the educational parallels, examining policy, pedagogy, and practices. Part III then guides readers through a clear curriculum “makeover” process. The result? Better learning that engage students in solving problems in their schools, communities, and the larger world. This free guide provides activity ideas and suggestions for structuring workshops, courses, or other facilitated settings. This book challenges the idea that we must choose between standards/objectives and creative, dynamic teaching. In fact, you’ll not only see standards-based examples throughout the book, you’ll find that your redesigned curriculum exceeds standards. Why? Because meaningful social and environmental challenges require that students master the material. Check out some case studies from Creative Change, the nonprofit organization I founded in 2002.